Endless IPA | Goose Island Beer Co.
Long days and warm nights awaken the city. The list of neighborhood festivals is endless. As is the great music that brings us together in parks and parking lots. We brewed our Session IPA to be easy drinking and endlessly refreshing, so you can enjoy every encore. Bright note of fresh oranges and other citrus fruit with a mild body that is crisp on the palate. Fresh and fruity hop character on this one, esp. in the taste. Finely bittered without excess with pleasing bittering flavor and long lingering. Golden to amber in color quite clear and nice firm white head. Lighter feel with ample carbonation leaving a filling feel. The smaller size does impact feel and malt character, but this is nicely drinkable and still holding an IPA quality. Good for warmer season. A - A nice looking pour, with a light golden body and a short white head. The lacing is fine but present, creating a thin-lined curtain on the side of the glass. S - Hops, mostly, of grass and a touch of lemon, and a hint of malty sweetness. T - The malt is more forward, underneath a punchy but largely nondescript bitter hop flavor. The close continues bitterness, as the malt drops away. M - Brisk carbonation, very light body, dry close. O - The problem here is a lack of much to grab onto to distinguish it. The hop notes are muddled and while pungent, do not offer discreet flavor notes that I prize when having an IPA. The taste is of a basic, kinda-poor-man's session IPA. It has a solid dry hop flavor. Some grassy taste underneath. Some watermelon and grape fruitiness in the back. It's a light beer. Very carbonated. Very easy to drink. Gold color, extremely bubbly throughout. It has a thick foamy head and a good deal of lacing. Completely clear. It has a very aromatic hoppy, weed-like scent. 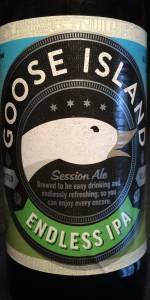 Endless IPA from Goose Island Beer Co.